Ryan tells Helen about Sharon having feelings for him. Now she is late home from the school dance. Helen says Ryan had better talk to Sharon when she gets home. Kerry is doing her accounts while Joe is on the phone to Noelene. Joe is quite gutted that Toby is settling in well in Darwin. He can't see when they'll ever have the money to get to Darwin. Kerry says they're just about surviving financially, but getting a couple more kids to look after will make a difference. Joe feels ashamed that Kerry is having to work to keep them afloat, but Kerry reassures him telling him he has no reason to put himself down. Aw. Sharon comes in from the school dance and says that she had a good time the Marc at the school dance. Helen knows she's lying of course, but doesn't say anything. Kerry has made Joe a packed lunch so they can save money. Joe sees Paul and calls out to him. He asks him about the playground business - he wants to put it all behind them. Paul agrees and says there's no hard feelings - he's sick of feuds. They shake hands. Joe goes on to ask Paul for his old gardening job back, but Paul has already got someone else doing the job. Paul says he can't do anything - the new guy has a contract, but he'll keep Joe in mind if anything else comes up. Joe slumps off, disappointed. Nick is looking forward to telling his teachers that he's off to London(!) Helen says she's very jealous of him herself - she's love to do it. She says she might come and visit him in London! Nick is feeling a bit nervous about going abroad - he feels like he's going off to Mars. Helen offers to lend him her travel books so he can get a feel for England. HELEN: Sometimes, to get what we want out of life, we have to take risks. Sharon has phoned school to tell them she's sick. 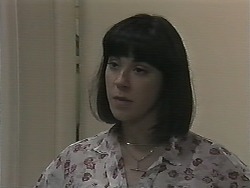 Helen offers to make her an appointment with Beverly but Sharon refuses. Helen tackles her about the school dance and Sharon realises she's been talking to someone. Sharon says that she made such an idiot of herself - her date didn't exist. She went to the dance on her own, saw Ryan with Kirsten, and everyone else in a couple and was very upset. So she spent the night in the Coffee Shop on her own. Helen hugs her in sympathy. SHARON: I don't want to face anyone. Paul and Helen are having a cup of coffee and catching up. Paul says it's almost perfect sharing with Caroline and Christina - he's not looking forward to moving back to the hotel. Helen isn't looking forward to moving back to the Robinson house either, especially now Nick is going to London. She's so sad to see him go - he's been like another grandson to her. Paul suggests that she could ring a friend in London to look after Nick for a while. Helen looks pleased. Kerry is looking after five kids as well as Sky. Lochie and Natasha are fighting as usual. Kerry tells Lochie she's had enough of her - as punishment she has to wash the dishes all by herself. Natasha smiles in triumph. Ryan has come round to see Sharon. She isn't very pleased to see him, but he says Sharon is a good friend - she and Nick helped him so much when he first came to Erinsborough. They agree to be friends. Joe is loading up his van, when Dorothy (although we don't know her yet) drives up in her car. She asks Joe which is No.32, but he is listening to a race on his radio. His dog loses at the last second. Apparently Dorothy is looking for Kerry. JOE: I'm her husband, Joe. DOROTHY: I'm Dorothy Burke. I'm Tiffany McLachlan's aunt. JOE: Oh, that little spitfire! Wonder if she takes after you? 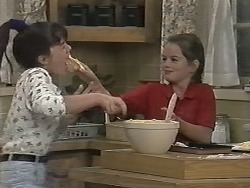 DOROTHY: I've always thought she does - take after me. Joe points Dorothy towards the house before taking off in his van. Lochie is sullenly washing up. Kerry takes the smaller kids out to the garden, leaving Lochie and Natasha on their own. They immediately start arguing. Kerry has come in and is explaining to Dorothy that Lochie is very mischievous, so she told her to wash up to keep her out of trouble. Lochie pours forth a stream of lies. Dorothy doesn't know what to believe, but she has grave doubts about Kerry's ability to look after Lochie. She's talk to Lochie's mother about it. Kerry contains her anger and doesn't say anything. Sharon is telling Nick how much she'll miss him when he goes to London. Helen comes in and tells Nick she's got some wonderful news - Rosemary is in England at the moment, and she's agreed to meet Nick and introduce him to friends of hers. Joe comes in to find the house apparently empty. He rings the betting shop and puts a bet on - $25 for Jezebel in the fifth. Kerry comes out of her bedroom. 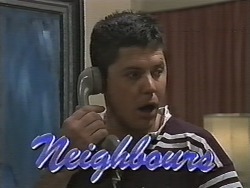 KERRY: Joe Mangel, what on earth are you doing?